The G sedan is up against the very best that Germany has to offer, and that is one of the most difficult things that a carmaker can do. Infiniti does a good job of besting the Lexus IS, but the G just doesn’t quite measure up to the driving experience offered by the Germans. 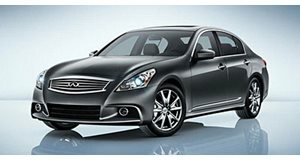 Where Infiniti has the edge is in pricing. They have remembered that an entry-level car should be relatively inexpensive, and the base model is already several thousand cheaper than the competition before you even get into the horrible gouging that companies like BMW engage in with their options lists.